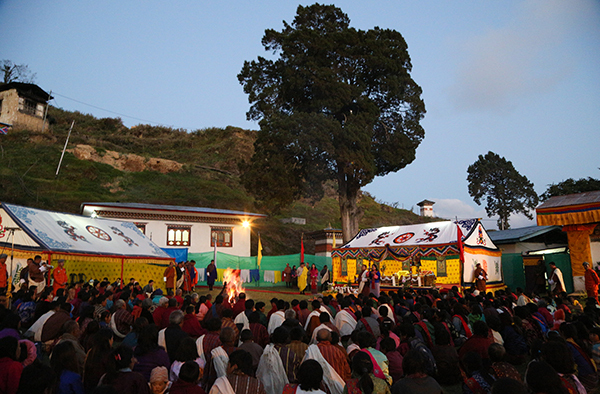 The Royal Tour ended with their Majesties’ visit to the Dokhachoe Goenpa in Chapcha Gewog. At the Goenpa, His Majesty offered prayers for the longevity and wellbeing of His Majesty the Fourth Druk Gyalpo, and for the peace and prosperity of the people of Bhutan. Their Majesties met with the people of Chapcha, Gangkhar, and Shamaka and granted Tokha to the people. Their Majesties arrived in Chapcha on Sunday, after having met the people of Bunagu, where His Majesty granted Tokha to the people. On Sunday, His Majesty granted an Audience to the participants of the Bhutan Executive Services Training at RIGSS in Phuentshogling. His Majesty celebrated Dashain on October 22 with the people in Loggchina Gewog, and visited Pachu the next day. On October 21, His Majesty visited Samphelling. Their Majesties also graced the Chhukha Tshechu on October 20. The Royal Tour Commenced from Chhukha Dzong on October 15, where His Majesty granted Land Kidu to the people of the dzongkhag, and audiences to civil servants, corporate employees and local leaders. His Majesty then visited Lobneykha, Darla, Meritsenmo and Bongo. During the 12-day Royal Tour, His Majesty met extensively with the people, granted them tokha, and addressed and discussed various national issues over public meetings. His Majesty also visited people individually in their homes and granted audience to students of schools in the villages.